Eating Disorders often become one of those judgemental taboo subjects – we see television, magazines and social media body shaming, we hear flippant remarks of ‘my god is she anorexic!’ passed around as easily as the names of celebrities… but what we actually know about them is very little. Much like many taboo subjects eating disorders make many people feel uncomfortable, and as such they avoid any discussion about them. Behind closed doors they may discuss a friend, family member or work colleague who they have noticed has ‘different’ eating habits but the likelihood of someone actually sitting down and having that uncomfortable conversation with someone is unlikely. I should know – I had one. I was late to the game, at 26, to develop an eating disorder isn’t as expected as if I had been a teenager, and being older (and in full time employment) I had more control over my eating and exercise habits than most do. We tend to associate eating disorders with those who are in their teens, in the onset of puberty and for many it is a habit that will continue into adulthood. The support services are still limited and parents have to fight to get seen. Once their child is over 18 the road to support is harder and often becomes privatised as parents seek any help they can possibly get whilst watching their children like a hawk. Beat.co.uk acknowledge that “over the last 30-40 years, instances of eating disorders have increased to become a widespread problem. Beat estimate that there are over 1.6 million peoplesuffering from diagnosed or undiagnosed eating disorders throughout the UK”. Whilst these are only a few of the issues that can lead to an eating disorder being undiagnosed they start to paint a picture of why these mental health issues are not receiving the treatment that they deserve. The secret nature of eating disorders means that many have taken hold by the time someone realises something is wrong. The issue is that eating disorders (whether anorexia, bulimia, binge eating, compulsive overeating, orthorexia or EDNOS) are all mental health issues, and require appropriate support. However resources are limited and each county in the UK has a different approach to diagnosis and treatment so the difference of only a few miles in geography can affect the support and treatment received by an individual. At 26 my anorexia battle wasn’t the conventional, nor did it fit the ‘stereotypical’ approach expected by many. I didn’t get up one morning and think ‘lets stop eating’ nor did I wake up and think ‘ooo an eating disorder would be great fun’. Having experienced a trauma in my early 20s which affected me emotionally, intellectually and socially I felt like my life was out of control. Perhaps if at the time I had met a therapist who acknowledged what I now know – that it was a trauma and not just a general life experience – some of this may have been avoided. The GP had sent me for a handful of counselling sessions where two ladies looked at me across from their clipboards and asked a few questions from their tick list about my wellbeing to which I realised that they didn’t understand me at all, I told them I was fine and getting over it and went back to work, there was no follow up – their report said nothing of significance – retrospectively with the right questions, listening and some empathy things could have been dfferent. At 24 how was I to know that it was a trauma that would wreak havoc over my life for the following years? Surely that was the responsibility of trained professionals to pick up trigger points and signs? Maybe this explains why so many young people end up on paths that they did not choose – a lack of empathy or the right questions? Fast forward 18 months and it felt like I was on a never ending rollercoaster. Whilst the triggering experience I had had seemed to entertain so many people inside I was tormented, anxious and at times depressed, my salvation became the gym, where I could spend hours hiding away from the world with my ear phones in feeling like I was in control of one aspect of my life. I was holding down a full time job, winning company awards and completing my degree so on the outside to many it seemed that I ‘had it together’ but over coming months things began to slip. Food became a thing to control, initially it was not about weight or appearance, just merely a desire to be healthier, removing unhealthy snacks and replacing them with fruit, but when havoc is appearing in your life this quickly spirals. At times when life was more peaceful my eating would be a little more relaxed (although it was counterbalanced by extra gym sessions). When life was chaotic food became the enemy I could take my frustration out on. This power struggle would escalate and eventually avoiding food became an easy activity, often existing on one meal a day. 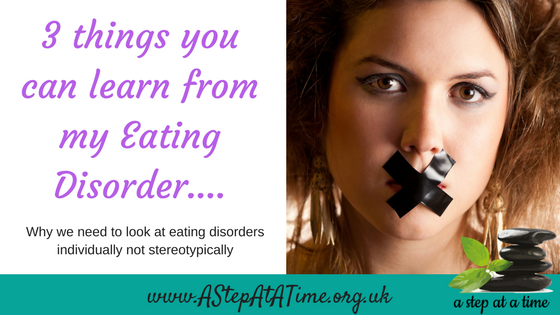 No two eating disorders are the same – as such we need to acknowledge that looking for ‘stereotypes’ can lead to mis-diagnosis or a lack of diagnosis. Someone with an eating disorder may not look terribly underweight, they may eat in front of you, they may be able to tell you about healthy eating. Bulimia, anorexia, orthorexia, EDNOS and binge eating disorder all look VERY different in different people – if you are uncertain get some advice, talk to a professional or seek out a support group who can support you. If you are looking for support because you are unsure about you child or family member please feel welcome to join us at my monthly parent’s meeting – details HERE. Eating disorders are NOT all about being thin or about food. They can be triggered by a sense of being out of control or having lost control of life. Often following a trauma where life decisions are made for you (rather than by you) or following a shock or difficult experience a loss of appetite can be usual, however if this is prolonged seeking advice from a medical professional is advisable. Being aware that not all eating disorders sit in the same box and have the same symptoms is imperative in early intervention. Many people believe that making someone with an eating disorder eat is the route to recovery, however this is only part of the journey. The longer someone manages to deny themselves food or exists off minuscule portions the greater the demand of the thought process to starve themselves. So whilst the first step is to start a regular, progressive eating pattern so that the brain is fuelled by appropriate nutrients there is additionally a requirement for appropriate therapeutic interventions to support the development of thought processes that see food as a necessity and not an enemy alongside changing the response to triggers events is imperative for longer term success. Finding appropriate therapeutic teams to support the recovery process is therefore imperative. If you are concerned about a friend, family member or child you can visit www.beat.co.uk for information about eating disorders or contact your GP who will be able to offer guidance of next steps.